As a leader in the Irish market in fabric graphics, signage and other graphic solutions for retail, we need to have the most up-to-date information for our clients. With this in mind we decided to head over to Globalshop in the USA in March 2016. GlobalShop is the world’s largest annual show for retail design and shopper marketing. It features the industry’s most comprehensive array of store fixtures companies, graphics suppliers and in-store solutions. Exhibitors and attendees come from across the globe to witness some of the newest and future trends. 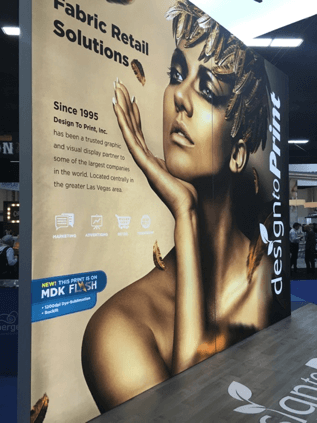 For an example of the standard of exhibiting at Globalshop it is definitely worth checking out this award winning stand from Visual Solutions company Duggal. What was evident for a start was the predominance of Fabric Graphics on every stand. Every supplier of digitally printed graphics was emphasizing the quality and flexibility of digitally sublimated fabrics over traditional digital printing materials. In Ireland traditional printing methods such as screen printing are still commonplace, however it is evident that companies around the world are now seeing the main benefits of fabric graphics. The quality of fabric graphics in comparison with traditional solutions is actually astounding. Printing on fabric results in rich, vibrant colours, that you cannot get from most other forms of printing. The creative opportunities with fabric graphics really are endless. 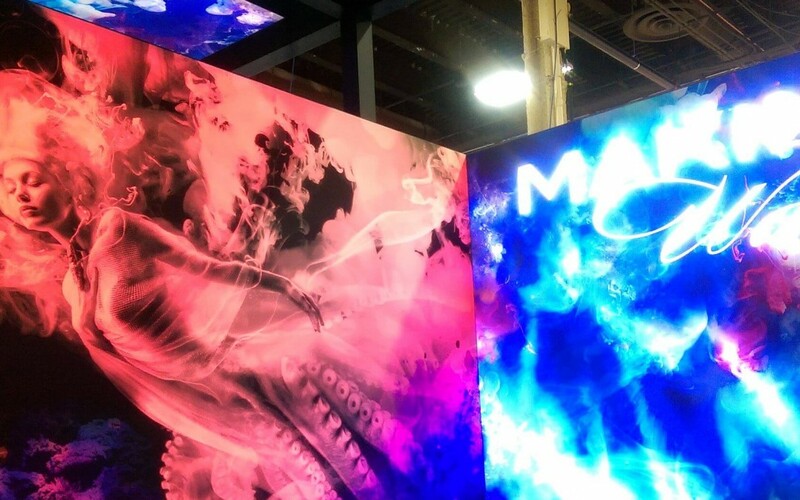 At Globalshop one of the big emphasis was manipulating light behind fabric graphics. In Ireland fabric light boxes are used to some degree, however here the companies got creative and used lighting cues and multicoloured LED lights to make their graphics stand out! Fabric graphics effectively render expensive installation crews useless. Most fabric solutions are light, carry-able and extremely easy to assemble. The graphic clips into the frame and can be just as easily unclipped for changing graphics. Whether it is for wall graphics, wall mounted or free-standing lightboxes fabric is the way forward. The colour vibrancy is outstanding. There is no limit to how creative you can get with them. The graphics are easy to change with no need for installation crews. There are no real size limitations either so replaceable fabric prints are taking over from adhesive based substrates as they can be changed seasonally with no damage to walls. 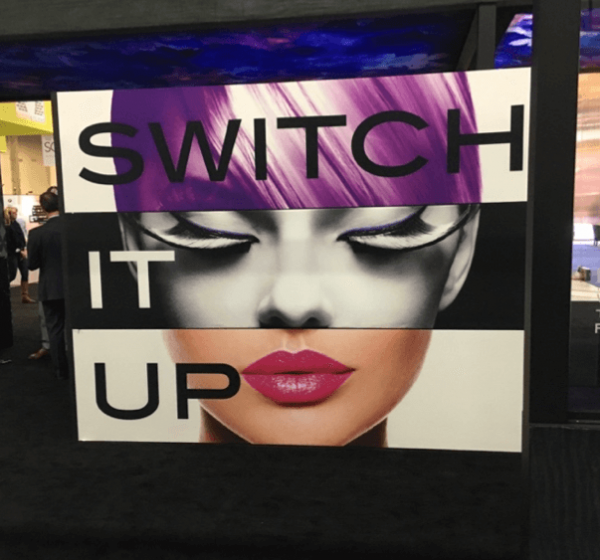 From our Globalshop visit in 2014, Cuspal made a decision to invest heavily in Digital Fabric Printing technology. We did this in 2015 and customers who have made the switch to fabric graphics for their brand promotions are delighted with the results. Watch out for more blogs about our Globalshop visit and the trends in the United States in retail display and signage. If you would like to take a look at what we saw at both the Digital Signage Expo and Globalshop you can view our video soon!